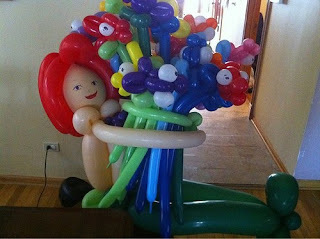 Before heading out on my tour, I did a balloon delivery. It might have been biting off just a little too much, but it certainly seemed like a good idea when I agreed to the delivery. I have my balloons so I'll be doing some sculptures on the rode. Yay for my week of adventure! In the midst of hurriedly packing for my bike trip two weeks ago, I had a sudden urge for a handlebar bag. Previously I had looked at options, but hadn't really seen anything that made me really want to purchase it. Plus, since I use my top mounted break levers a lot, most handlebar bags don't fit my needs. It was 6 am and I was packing my bike stuff before heading to work and I realized that I have dozens of bags of all shapes and sizes. Canvas bags for groceries, vinyl bags for toiletries, random totes from conferences and many purses that I just don't use because I ride a bike every where. My August bike trip is slowly falling into place and I couldn't be more excited. I have a rough outline of what I'm going to do and really just can't wait for the week to get here. I've decided that the trip is going to be the Oddity Tour of Wisconsin, 2010. That state has tons of Kitsch and I am ready to fall in love with it all. Hopefully I can make some balloons in all of those places. Hopefully, it doesn't get me kicked out. Since I want to see stuff while on the trip, I'm going to be keeping the mileage down, which will be useful since I'm already a little concerned about the rolling hills of Wisconsin compared to the flat gradient of Chicago. On Friday morning, I packed all of my camping gear onto my bike and headed downtown to work a half day. By 1:30, I was on the train to Harvard, IL and getting ready to bike 30 miles to Kettle Morraine State Forest in Wisconsin for a weekend camping trip with an awesome group of women. The train ride was crowded, but uneventful, but at 3:20 I was on my bike and rolling towards the Cheddar Curtain. It's always so strange to get out of the city these days. Being able to bike for miles wihout seeing a car or another person is relaxing and peaceful. I knew that i had the tools on hand to fix flats, or my chain, or even to replace my brake cables. Being self-sufficient is a wonderful feeling. It was also comforting to know that I had a friend coming along in a car to meet me at the camping site. This past Sunday I hosted a picnic for my friends and any bikers that were interested in coming. Upon a recommendation, I choose a quiet corner of Montrose Harbor where we set to picnicking for a few hours. I didn’t take any pictures because I was too busy talking to all of the wonderful people who came out. The only pictures I have is my loaded trailer on the way to the picnic. I took a Rubbermaid container with four towels, balloons, 2 kites, blanket, tools that I always take when biking, and other random stuff. On top of the Rubbermaid were 2 folding chairs, folding stool and a beach umbrella. Behind that was a six foot folding table. Not really visible was a cooler with 50 lbs of ice blocks, then a smaller cooler with some more cubed ice. Not quite sure how many people came the picnic. At least 20 at one point…but more came and went throughout the afternoon. It was a very good time and I’m hoping to do it again in August! On Sunday I threw a picnic! The food was great and all, but the real star of the day was ice blocking. Earlier that morning I went over to the giant ice machine and bought 50 lbs worth of ice blocks. Then I loaded up my trailer, with picnic supplies, towels, yadda, yadda yadda. Ice blocking is a traditional activity for places that have very little in the way of entertainment. THe concept is simple. Take a block of ice and a towel, go find a grassy incline of some kind. Go to the top, sit on top of the ice, using the towels as a frigidity buffer. Slide down the hill. While we were biking around beautiful Peninsula State Park up in Door County, I had a pretty serious mechanical failure...my chain broke while I was shifting to go up a hill. Here in Chicago, we don't have hills, so I know my shifting technique really needs help. Fortunately, back when I got my bike multi-tool, I asked my local bike shop, Roscoe Village Bikes to show me how to use the chain tool. Since I had my tool with me, I set to getting that puppy fixed. I popped off the busted links, and threaded the chain back on. The hardest part was reattaching the links, but after a few tries, I got it to work. After I finished up, I realized that I didn't document the experience but my filthy hands were certainly evidence enough. So happy that my over-preparedness has paid off again! Late on Monday, we got back from a long weekend trip up to Sister Bay in Door County. I haven't uploaded the pictures from my camera, but I thought that I'd start reflecting on the trip. Actually, it was beautiful up there... I'll have more to say soon! Most teenagers haves something over which they spend a lot of time obsessing or contemplated. Some have cars, or bands or actors. For a time, mine was Canada. First I thought of Canada as a menace which must be appeased. They are up there in the North, going quietly about their lives…but seeming much better than the United States. They must be up to something. I figured that at some point they would swarm over the border and spread the Canuck way of life to us Yankees. I learned the O Canada, hoping that I’d be able to appease the foot soldiers, or at least confuse them with my northern knowledge. I was never afraid of Canada, but this obsession soon turned into a desire to be Canadian. I wanted socialized health care, green spaces and a maple leaf as my national symbol. I met Tessa who shared my thoughts about Canada and together we formed a sort of Canada Fan Club at our school. We thought moose were cool and said “eh” a lot.